Fide Chess Master (FM) Nsubuga Haruna from Uganda fought through an array of top chess talent from East Africa to win the inaugural Equity Bank Chess Open held over the Jamhuri weekend at the Luke Hotel in Nairobi. Haruna won in the prestige section while Walela Austin and Woman Candidate Master (WCM) Joyce Nyaruai bagged gold in the open and ladies’ categories respectively. Jeff Gichuki Maina emerged the winner in the under 12 junior category, while Karania Hardiv beat his peers in the over-12 years juniors section. 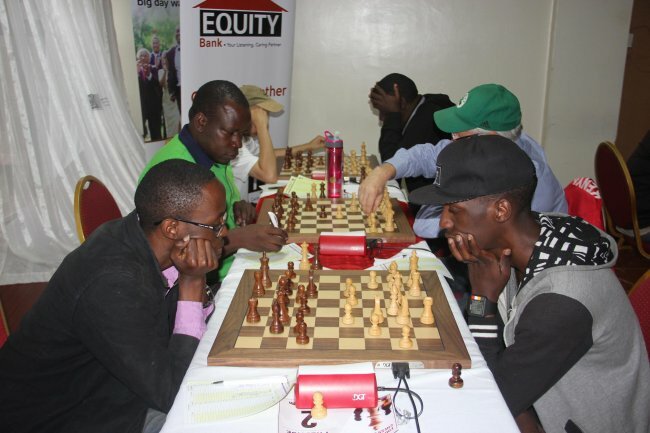 With a low key year for the chess calendar, the much anticipated three-day event, which was sponsored by Equity Bank, brought relief and excitement for chess-hungry players. The event attracted players from Kenya, Uganda, South Sudan, Zambia, Tanzania and Somalia. The great ambience of the Luke Hotel provided the perfect environment for the players paving way for a very competitive and exciting weekend. In the tough-fought prestige section, Nsubuga battled his way through top seed players Patrick Kawuma Peter Gilruth (Kenya), Gohil Mehul (Kenya), FM Harold Wanyama (Uganda), Brian Toboso (Kenya) and IM Ssegwanyi Arthur (Uganda). Even with Ugandans sweeping the podium, notably absent at the event were Candidate Master (CM) Ben Magana, reigning Kenyan champion CM Ken Omollo and Githinji Hinga from Kenya and IM Elijah Emojong of Uganda. The Kenyan team was led by the country’s highest rated player and Olympian Peter Gilruth, who gave the Ugandans a run for their money. Other Olympians Mehul Gohil, FM Steve Ouma, Lawrence Kagambi and Clement Miheso were in the hunt, and so was South Sudan’s aggressive attacker James Panchol. From day one, the tough contingent from Uganda ruled the boards. Redemption came in the Open and Ladies categories in which local players managed a clean medal haul. In the ladies section, Olympiad debutant WCM Joyce Nyaruai, proved her mettle as she swooped down on seasoned players to carry the day. Austin Walela's hunt for points proved effective and eventually bagged the gold in the Open category. Prestige: 1. Haruna Nsubuga 5 pts (Uganda), 2. Patrick Kawuma 5 pts (Uganda), 3. Arthur Ssegwanyi, Mehul Gilruth 4.5 pts( Uganda). Open Category: 1. Austin Walela 6.5 pts (Kenya), 2. Joseph Methu 6 pts (Kenya), 3. Joseph Andiwoh 6 pts (Kenya). Ladies Category: 1. Joyce Nyaruai 6.5p ts (Kenya), 2. Isabelle Asiema I5.5pts (Kenya), 3. Deshpande Sanjana 5.5 pts (Kenya). Juniors (Over-12) Category: 1. Hardiv Karania 5 pts, 2. Gowri Vadrevu 4.5 pts, 3. Sarah Mukhwana 4.0 pts. Juniors (under-12 Category: 1. Jeff Gichuki 6.5 pts, 2. Vivian Muthoni 6.0 pts, 3. Mohit Srungarapu 6.0 pts.